I first tasted these delicious sweet treats at my bachelorette party. (Thank you, Quinn!) We have since baked them for special occasions and have received requests for the recipe. Here you go, friends! They’re a perfect dessert for your spring celebrations, especially Cinco de Mayo! Preheat oven to 350°F. Place foil baking cups in lightly greased muffin pans; coat foil cups with cooking spray. In a food processor, pulse chocolate wafer cookies until finely crumbled. Add melted butter to cookie crumbs; stir to combine. Firmly press onto bottom and up two-thirds of each baking cup (about 3 tablespoons crumbs per cup). In an electric mixer, beat cream cheese and sugar until blended. Add lime zest and lime juice; beat at low speed until blended. Add eggs one at a time; beat just until yellow disappears. Spoon mixture into prepared cups until completely full. Bake for 20 minutes or until set. Cool in pans on wire racks for 15 minutes. Remove from pans and let cool for an additional 15 minutes. Cover and chill for 4 hours. To prepare whipped topping: Beat cream with sugar and vanilla until soft peaks form, about 5 minutes. 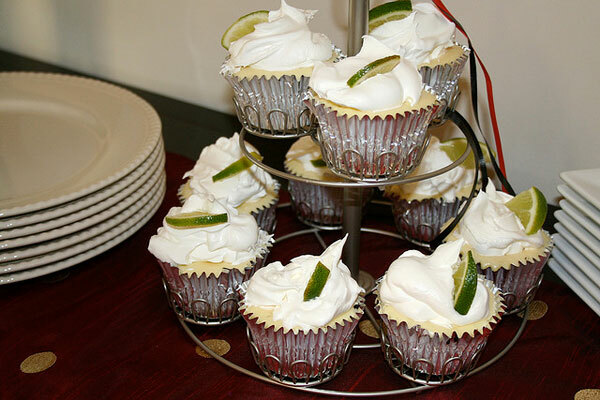 Garnish cupcakes with whipped topping and lime wedges. How gorgeous are these amazing cupcakes – yummy. I think I am the only person who doesn’t have a cute cup cake stand. These look super tasty. Love lime! The frosting looks so light and dreamy too.